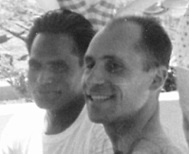 Doctorji and George at a NYC beach in the late 1950’s. 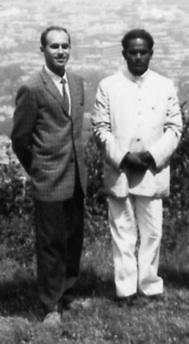 George and Doctorji at the Palisades Lookout, on an excursion looking for an ashram in the 1960’s. 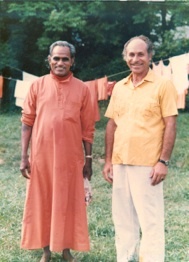 Guruji and George outside the cottage on laundry day. George with students at school preparing poetry for magazine publication. George posing for a publicity shot in the late 1970’s. 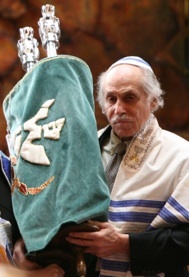 George carrying the Torah through the congregation in 2009. Born in Brooklyn to hardworking immigrants, George Bailin grew up with several dominating factors: an extended family that supported him even when they didn’t understand him, a thirst for truth, a passion for writing, a joy in sports, an abundance of energy, and a fear of the anxiety that would erupt during stressful times. The oldest of four children born to Marion and Herman Bailin, George has two brothers, Jerry and Stuart Bailin, and a sister Iris Bachman. 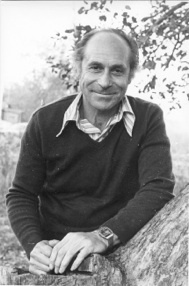 Professionally, George attended Brooklyn College, Manhattan College, and Sarah Lawrence College, graduating with a BA in English, and MFAs in English Literature and Creative Writing. Two of his best friends, with whom he spent many hours writing, were Howard Sackler and Murray Schisgal, who both went on to achieve fame writing and directing movies and plays. George however, now married to Marilyn, and the father of two children, Mike and Jill, went another direction. His Zayde and Bubbe, Orthodox Jews, were influential in his early spirituality and arranging his bar mitzvah at 13. After college, he began to attend various religious institutions and leaders. However, none were able to answer his questions, until he met Dr. Rammurti S. Mishra in 1956. This meeting, recorded in Ready To Give Everything, altered the focus of his life. A born teacher, George spent 30 years as a high school English professor at several different schools in New York City. During this time, he became a mentor for both students and fellow teachers, and was active in developing the teachers union and promoting civil rights. Taking early retirement from the NYC school system in 1983, he went on to teach English Composition and Literature at several community colleges in New York and New Jersey, retiring in 2001. Writing has been George’s lifeblood, a daily practice he began in childhood and continues to this day. The topics he writes on vary, from social activism, to political commentary, to the challenges of daily living. However, permeating everything he writes is a desire for, and a fostering of, spiritual understanding. His skill and understanding of the subject was such that Dr. Mishra often asked him to edit his writing. His monologs, scripts, poems, articles and essays have been published nationally by such magazines as Black Country, Puckerbrush Review, Kansas Quarterly, Goblets, Webster Review, Salome and Mississippi Valley Review. He founded Seaport Poets & Writers Press to assist publication of his Poetry & Prose and give workshops to support fellow writers. A dramatic performer, George was a frequent reader on Columbia University’s radio station WKCR with Tom Vitale in New York City. He gave the first dramatic readings of many of his poems at the St. Clements Poetry Festival in New York City, as well as at the Somers Free Library in Somers, New York. For decades, he frequently regaled audiences at Ananda Ashram in Monroe, New York, bringing light and laughter to the meditation programs led by Dr. Mishra, his friend and spiritual advisor. His writings on Dr. Mishra include Ready To Give Everything: Reminiscences of Doctorji, and Sage of Ananda: Shri Brahmananda Sarasvati. 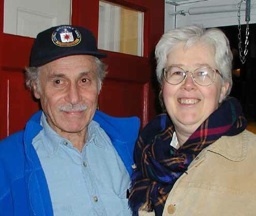 Since 1986, George has been living with his second wife Daryl in Monroe, New York. 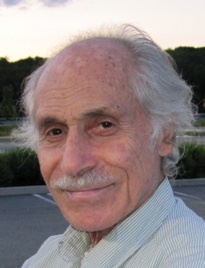 For 11 years he wrote and Daryl edited Meditator’s Newsletter, a monthly publication of poetry, prose, essays, spiritual quotes and exercises. In 1995, they cofounded Sacred Orchard, intending it to be a vehicle for promoting spiritual awareness. Since the passing of his guru in 1993, then known as Shri Brahmananda Sarasvati, George’s life has become increasingly contemplative. Yet he continues to visit the gym at least once a day, write day and night, cook occasionally, and spend time with his dog Gracie. And no day is started off right without a cup of coffee. 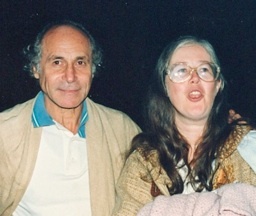 George and Daryl at Ananda Ashram in 1986, above, and visiting relatives in 2005, below. 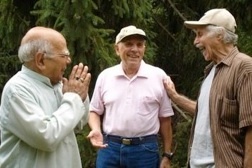 Dr. Ram S., George L. and George at Ananda Ashram in the late 1990’s.